Looming in our Congress are several bills dedicated to the creation of a yet another bureaucracy which will be used to facilitate the usurping of US laws, standards and regulations in deference to international agreements and global committee edicts. At stake here is what has been the most dynamic and productive agricultural system ever known….and the most safe. Our congress has decided that preserving this system and allowing it to continue is not beneficial to corporate AG nor to the continued compliance relating to non-US laws and regulations. The focus of every bill in congress devoted to fake [food safety] is aimed at eradicating any ability by non-corporate, non-industrialized farmers and ranchers to survive the financial and regulatory hardships that will result from these laws. 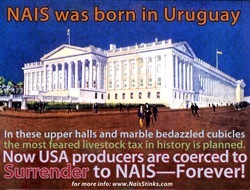 The forced compliance with Codex and with the Trans-Atlantic Economic Union will effectively end independent farming and ranching here in the US, just as these things have done in other countries. Reading the PR pages for Codex, you could come away thinking this was a global initiative dedicated to making sure food production and supply for the worlds populations, that food safety and availability was being promoted with an eye to humanitarian causes was the aim. You’d be wrong. Codex is funded and supported by the same bio-pirates, the same corporate world raiders who are intent on converting food from a human right into one of tradable, sellable commodities. Only those who can pay will eat. Why are Codex and corporate lobbyists lunching with our elected officials? Seldom has the detachment between congress and the people they swore to protect and defend, between our Constitution and sovereign laws and protections been more readily apparent than in the current flood of fake [food safety] bills and the intended mandatory National Animal Identification System. Using phrases such as “best farming practices, disease trace back and food safety” our congress is planning to use legislation to force the US into compliance with Codex and multiple other international agreements, regulations and standards. Citing contamination and the risk of food borne illnesses, congress again fails [or refuses] to cite the real and documented source of these risks domestically which occurs 95% of the time in processing…not production. The outbreaks of salmonella, ecoli, and listeria, and other contamination do not occur in production. These occur as the result of processors failing to adhere to sanitary standards but these days most processing plants are owned by corporate AG and profit far outweighs public safety. In almost every known case of contamination, the source has been traced to processing plants or to contaminated products from foreign countries, not to domestic growers and producers. So do all the fake food safety bills address any of these known problems? Are you kidding? Nothing in these bills does anything other than establish another federal agency which will be used to terrorize and harass independent agricultural and livestock producers while turning a blind eye and a deaf ear to corporate corruption and known sources of contamination from processing and imports which go un-inspected. No one! Your own elected representatives and senators don’t give a damn what you think, and could care less how opposed you might be to these assaults on your freedom. Democrats launched all these bills, but Republicans sit silently and don’t object; both parties are complicit in this assault on America. Both parties have been instrumental in the economic disaster that has brought us to the brink of collapse as a country. Now……they are coming after our ability to grow and consume our own food. Author's Bio: A new president but the same old crowd runs the Washington District of Criminals. We are under attack from all quarters by our own goverment. I have written for more years than I care to admit about the corruption of our government. At some point we have to decide whether we will cower and submit totally, or stand and fight back. I will never advocate going down without a fight. Listed below are links to blogs that reference this entry: Codex and corporate lobbyists lunch with our elected officials. This page contains a single entry by Toni published on April 8, 2009 9:11 AM. Advantame - new sweetener from Aspartame producer Ajinomoto was the previous entry in this blog. Contrails, Chemtrails is the next entry in this blog.